If you’ve been in recently you may have noticed the colorful seed display behind the counters. Oh the promise of seeds – those tantalizing pictures and mouthwatering descriptions of vegetables, flowers and herbs…all in a magical seed packet. Maybe you’ve never tried to grow anything from seed. That’s ok, there’s a first time for everything! 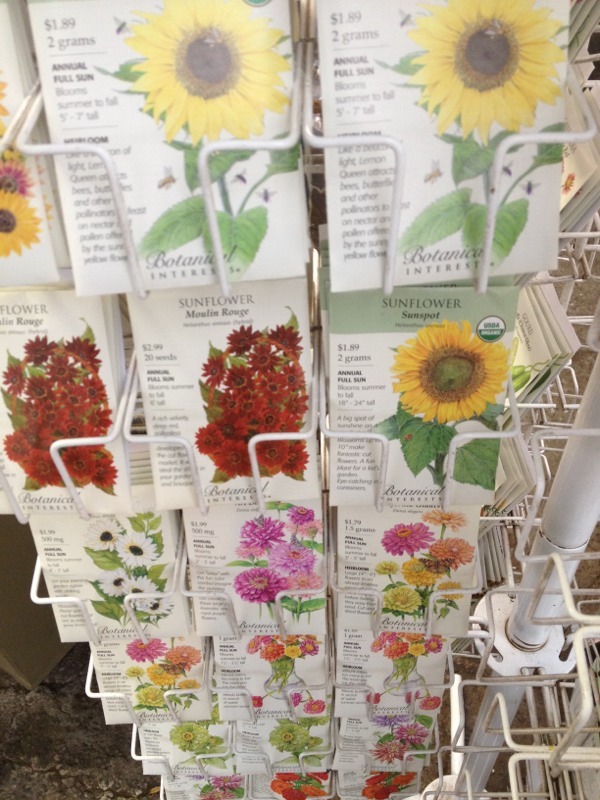 Here are some easy flowers to grow by direct sowing them right where you want them to come up in your garden: zinnias, sunflowers, cosmos, marigolds, tithonia (Mexican sunflower) and gomphrena are a few. Seed planting is a fun project for the little ones! Since you will be sowing these directly into the ground, you need to be sure the soil is warm enough for them, May is the perfect month to plant these. 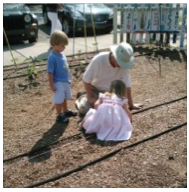 Here you can see Billy planting seeds in the garden with some little helpers in the community garden across the street last spring. 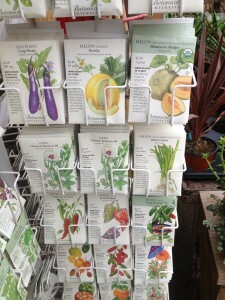 Below you can see we have veggie seeds too – and plenty to choose from as you plan your summer garden! Warm season vegetable seeds…eggplant, peppers, melons and more! This entry was posted in Annuals, Flowers, Herbs, Seeds, Spring and tagged cosmos, flowers, gomphrena, marigolds, spring, sunflowers, tithonia, zinnias on February 21, 2013 by Kris Blevons.